Wladimir Klitschko will attempt to regain the world heavyweight title by taking up his option for a rematch with new champion Tyson Fury next year. 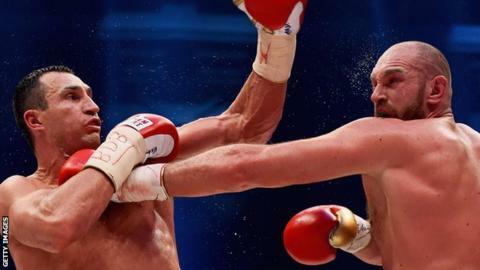 Briton Fury, 27, beat the Ukrainian in Dusseldorf, Germany, on Saturday to take the WBA, IBF and WBO belts. The contract for the fight included a clause for a rematch, for which the date and the venue have to be decided. "Failure is not an option," said Klitschko, 39, on his prospects of winning back the titles. "I was really frustrated directly after the fight, but after some short nights, I now know that I am much better than my performance on Saturday. "I couldn't show much full potential at any time. This is what I want to change in the rematch, and I will." Klitschko has had two spells as world champion, the first from 2000 to 2003. Having regained the WBO belt in 2004, he went 11 years and 19 successful defences before losing to Fury. Manchester fighter Fury said on Sunday that he would beat Klitschko again if they were reunited in the ring next year. Fury's uncle and trainer Peter told BBC Radio Manchester it was "fantastic news" Klitschko had taken up the option. He added: "We're definitely looking for a stoppage next time out - Tyson only performed to about 60% of his ability. He could have stopped Wlad. "We're looking at Wembley stadium in London, possibly mid-to-late May, and once Tyson gets rid of Klitschko then straight away we will be looking to Deontay Wilder to unify all of the belts." Unbeaten American Wilder holds the WBC version of the heavyweight title. BBC Radio 5 live boxing commentator Mike Costello: "Klitschko tweeted a couple of days ago how he was still suffering, and that sentiment explains why he has committed to the rematch only four days after his defeat. "The setback against Fury ended an unbeaten run for Klitschko stretching back 11 years and 22 fights. "At this stage there is no mention of a date or a venue for the return - they will decided with a view to maximising the purse for each boxer. "Although Klitschko turns 40 next March, the contest was the first of a new five-fight deal with German broadcaster RTL. "So, as he said on another online posting this week, the story will continue."